For the first time in U.S. history, a supreme court has granted a writ of habeas corpus on behalf of two lab chimpanzees, effectively recognizing them as legal persons. While the future of the chimps has not yet been decided, it’s a huge step forward in establishing personhood status for highly sapient animals. Yesterday, Manhattan Supreme Court Justice Barbara Jaffe issued an order to show cause and writ of habeas corpus on behalf of two chimpanzees, Hercules and Leo, who are being used for biomedical experiments at Stony Brook University on Long Island, New York. A writ of habeas corpus requires a detained person to be brought before a judge or court to secure their release unless it can be shown that they’re being held for lawful reasons. Stony Brook University, who are being represented by the Attorney General of New York, will now have to present their case to the court on May 6th. In New York, only a legal person can have an order to show cause and have a writ of habeas corpus issued on their behalf. The judge, by virtue of doing so, implicitly decided that the chimps are legal persons for the purpose of habeas corpus. “For the first time, a judge is ordering that somebody who is detaining a chimpanzee appear in a courtroom to justify this imprisonment,” Natalie Prosin told io9. She is the Executive Director of the Nonhuman Rights Project (NhRP), the petitioner in this case. But the fate of the two lab chimps has yet to be decided. Should the judge agree with Stony Brook’s legal cause for detention, the chimps will remain in the custody of the university. If they fail to persuade the judge, however, Hercules and Leo will be sent to Save the Chimps, a sanctuary in Ft. Pierce, Florida. 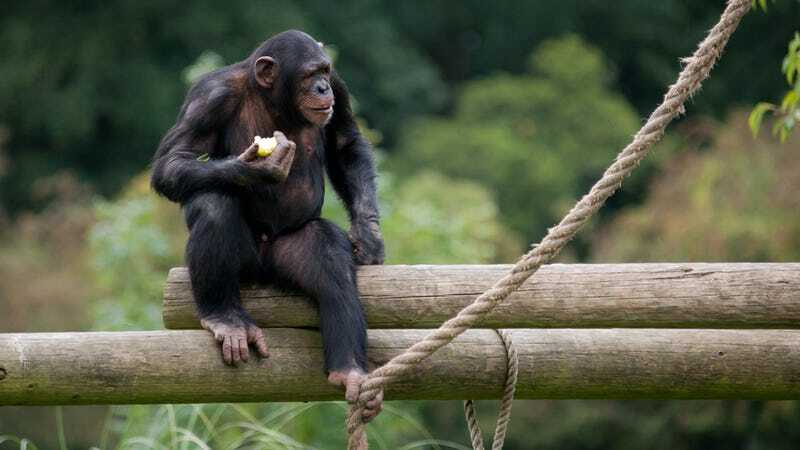 The NhRP says the chimps would spend their remaining days in the company of 250 other chimpanzees in an environment closely approximating their natural home in Africa. This case was originally filed in the Supreme Court of Suffolk County in December 2013, but Justice Asher denied the requested writ of habeas corpus. The NhRP re-filed its position in March 2015, leading to yesterday’s decision by the NY Supreme Court. The judge may merely want more information to make a decision on the legal personhood claim, and may have ordered a hearing simply as a vehicle for hearing out both parties in more depth. These kinds of claims are new terrain for judges, and we should be cautious about drawing conclusions as to judicial intent based on the format used to schedule hearings. My understanding is that in the other two chimpanzee cases filed by the Nonhuman Rights Project the judges entertained hearings before dismissing the cases. I am not aware of the judge handling the present case involving Hercules and Leo having a hearing thus far. The order filed today schedules a hearing and allows the opposing parties to file answering affidavits before the hearing. It would be quite surprising if the judge intended to make a momentous substantive finding that chimpanzees are legal persons if the judge has not yet heard the other side’s arguments. If Cupp is right, the May 6th hearing (which, from what I’m hearing, will likely be pushed back) won’t be a mere technicality. Because of the way the law works in New York, the judge may have been following legal protocol and not making any kind of definitive statement about the chimps’ status as legal persons. As for the NhRP’s case against Stony Brook, it’s important to note that this is not a welfare case. Animals granted legal personhood status would be subject to many of the rights naturally afforded to human beings, including the right to not be detained without cause, to not be experimented upon, or to have to perform against their will. The exact conditions currently experienced by the two chimps is not known, but they are being held for locomotion experimentation at the university’s anatomy department. The NhRP is also working on two similar cases involving two other chimps, Tommy and Kiko. Both cases are pending. Note: I reached out to Stony Brook University for comment but did not receive a response. Disclosure: I have worked with the NhRP in the past and am the founder and chair of the IEET’s Rights of the Nonhuman Person Program. Top image: William Warby/Flickr (not affiliated with Sony Brook University).